Fort Loramie’s Kennedi Gephart shoots during a Shelby County Athletic League game on Thursday at Clair C. Naveau Gymnasium. Fort Loramie’s Caitlyn Gasson blocks Russia’s Jenna Cordonnier during a Shelby County Athletic League game on Thursday at Clair C. Naveau Gymnasium. The Redskins made a school-record 12 three-pointers in the victory. Fort Loramie's Ava Sholtis heads for the net past Russia's Jessica York during a Shelby County Athletic League game on Thursday at Clair C. Naveau Gymnasium. Fort Loramie's Ava Sholtis shoots past Russia's Ashley Scott defends during a Shelby County Athletic League game on Thursday at Clair C. Naveau Gymnasium. Russia's Kendall Monnin and Fort Loramie's Taylor Ratermann chase a loose ball during a Shelby County Athletic League game on Thursday at Clair C. Naveau Gymnasium. 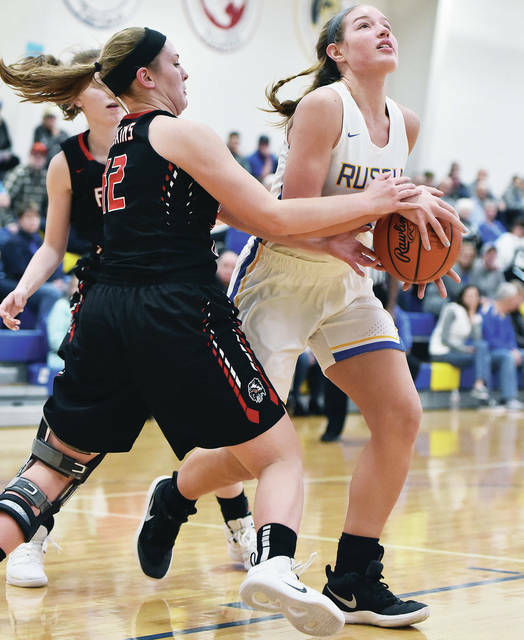 Russia's Olivia Moorman looks to get past Fort Loramie's Taylor Ratermann during a Shelby County Athletic League game on Thursday at Clair C. Naveau Gymnasium. 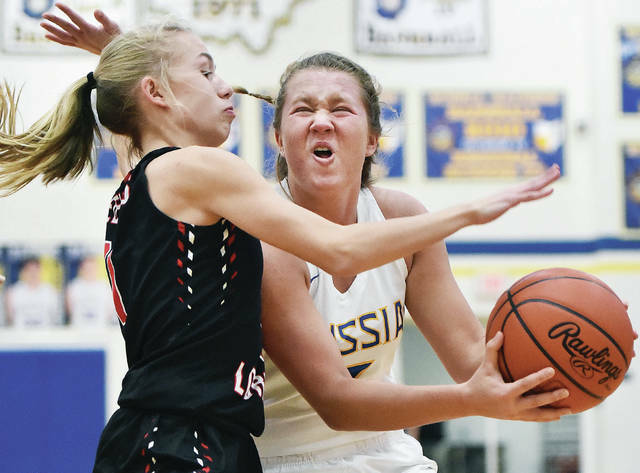 Russia's Laurissa Poling drives past Fort Loramie's Marissa Meiring during a Shelby County Athletic League game on Thursday at Clair C. Naveau Gymnasium. Russia's Laurissa Poling works past Fort Loramie's Ava Sholtis during a Shelby County Athletic League game on Thursday at Clair C. Naveau Gymnasium. Fort Loramie’s Ava Sholtis drives to the hoop with pressure from Russia’s Ashley Scott during a Shelby County Athletic League game on Thursday at Clair C. Naveau Gymnasium. 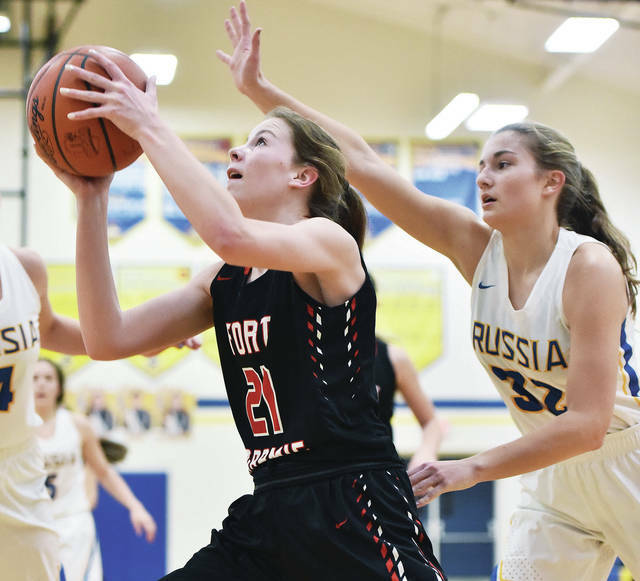 RUSSIA — Fort Loramie had to follow its double-overtime win over rival Minster with a road Shelby County Athletic League game on Thursday at rival Russia. What could have been a potential letdown game for the Redskins instead turned into another blowout victory. 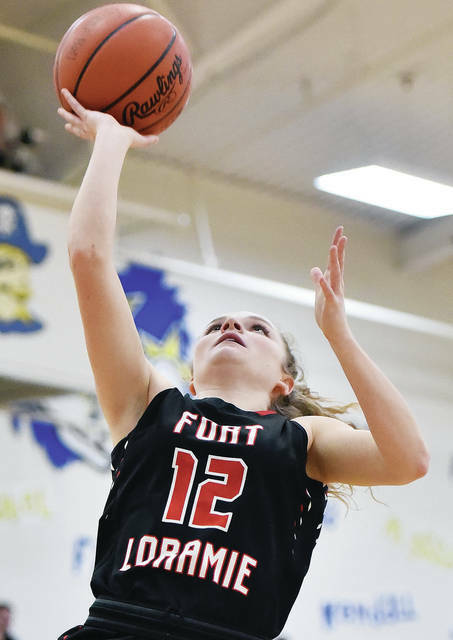 Fort Loramie jumped out to a double-digit lead in no time and cruised to a 78-31 win over the Raiders at Clair C. Naveau Gymnasium. It’s the 11th consecutive win for the Redskins (13-1, 7-0 SCAL), which haven’t lost since a last-second, one-point defeat at West Liberty-Salem on Dec. 10. 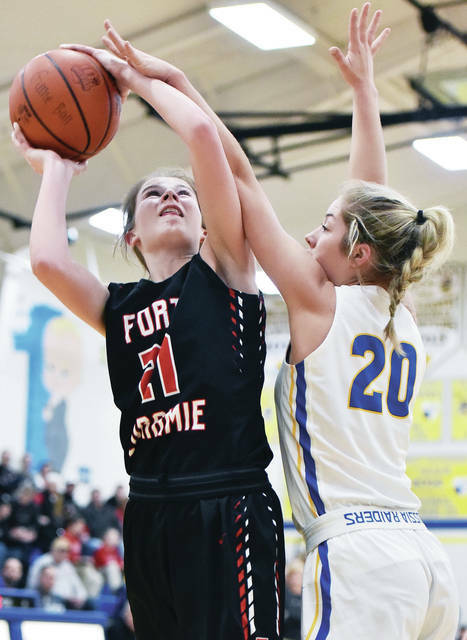 Fort Loramie set a school record by making 12 three-pointers against Russia. Six different players made 3s. The Redskins, which are ranked No. 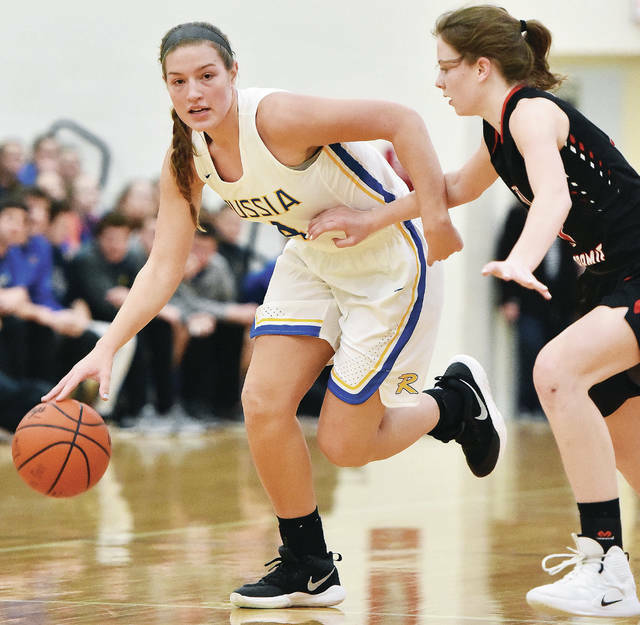 1 in Division IV in the Associated Press’ state poll, beat the defending state champion Wildcats by eight points last Saturday and beat Anna by eight on Jan. 3. Aside from that, they’ve cruised through their last 11 games. Their other nine victories in the stretch have come by an average score 55.3-22.1. They’ve held two SCAL opponents (Jackson Center and Fairlawn) to 13 points during the stretch. The loss drops Russia to 9-5 overall and 5-3 in SCAL play. The Raiders had won six of their last seven before an 11-point loss at Covington on Tuesday. 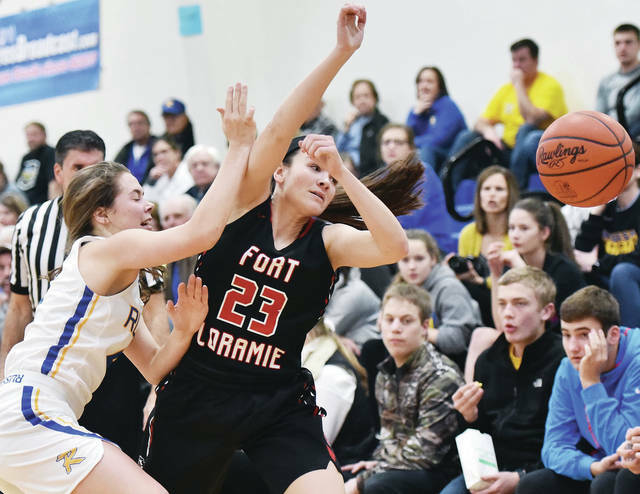 Kennedi Gephart led Fort Loramie’s balanced scoring attack with 13 points. Marissa Meiring scored 12, Taylor Ratermann had 11 and Kenzie Hoelscher and Dana Rose each scored eight. Gephart and Ratermann each made three 3s. Jenna Cordonnier and Laurissa Poling each scored 11 for Russia. The Redskins jumped out to a 17-6 lead by the end of the first quarter and scored five points by the 7:00 mark of the second to take a 16-point lead. After a brief slowdown against Russia’s zone, the Redskins found a shooting rhythm again and boosted their halftime lead to 37-8. Russia was outscored 20-2 in the second quarter. Fort Loramie will host Houston on Saturday for an SCAL game. The Redskins won the first matchup 83-22 on Dec. 8. Russia’s next game is Monday at Anna. The Rockets won the first matchup 45-34 on Dec. 8. Fort Loramie’s Ava Sholtis heads for the net past Russia’s Jessica York during a Shelby County Athletic League game on Thursday at Clair C. Naveau Gymnasium. Fort Loramie’s Ava Sholtis shoots past Russia’s Ashley Scott defends during a Shelby County Athletic League game on Thursday at Clair C. Naveau Gymnasium. Russia’s Kendall Monnin and Fort Loramie’s Taylor Ratermann chase a loose ball during a Shelby County Athletic League game on Thursday at Clair C. Naveau Gymnasium. Russia’s Olivia Moorman looks to get past Fort Loramie’s Taylor Ratermann during a Shelby County Athletic League game on Thursday at Clair C. Naveau Gymnasium. Russia’s Laurissa Poling drives past Fort Loramie’s Marissa Meiring during a Shelby County Athletic League game on Thursday at Clair C. Naveau Gymnasium. 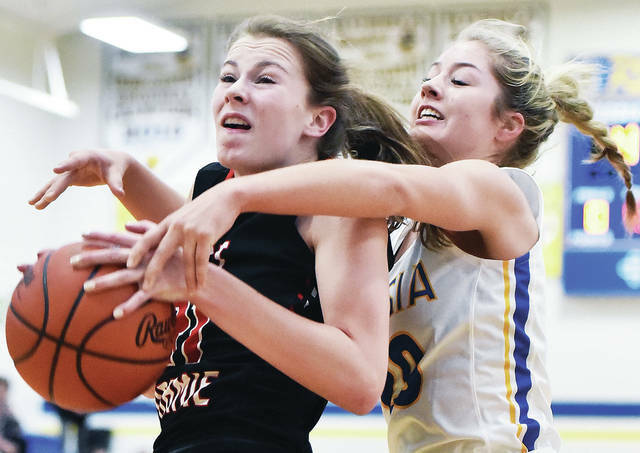 Russia’s Laurissa Poling works past Fort Loramie’s Ava Sholtis during a Shelby County Athletic League game on Thursday at Clair C. Naveau Gymnasium. 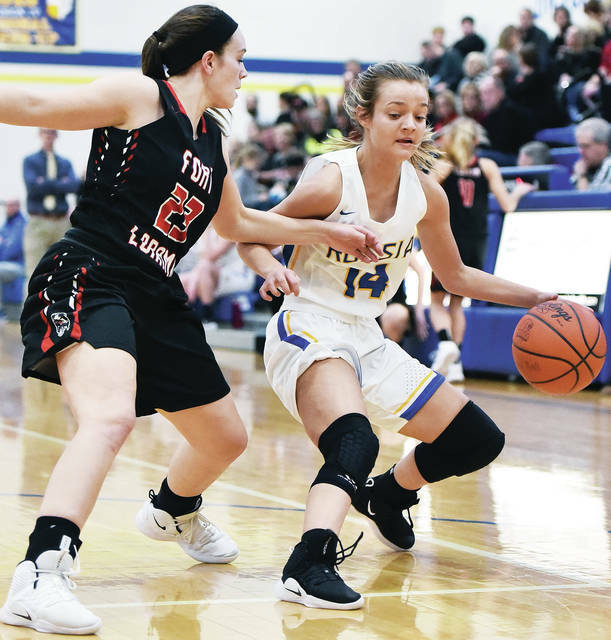 This entry was tagged Andy Timmerman, Ava Sholtis, basketball, Carla Siegel, Fort Loramie, girls, girls basketball, hoops, Jenna Cordonnier, Laurissa Poling, Marissa Meiring, Raiders, Redskins, Russia, SCAL, Shelby County Athletic League, Taylor Ratermann. Bookmark the permalink.